Buttery Mashed Potato Pie with Herb and Garlic Cream Cheese - What's In The Pan? A wonderful combination of potatoes, cream cheese, and buttermilk makes this garlic and herb mashed potato pie a delicious side dish to any meal. And these buttery mashed potatoes are conveniently baked in the shape of a sliceable pie – a new spin on an old favorite. These mashed potatoes are so creamy. And why wouldn’t they be? We’re using cream cheese and butter here, after all. And not just any cream cheese, but garlic and herb cream cheese! So good! I used a medium cast iron skillet here, 10 inch one, made by Lodge. It’s very sturdy, holds heat perfectly and has a helper handle! It’s perfect for baking a mashed potato pie! Using a cast iron skillet does make a difference in baking: cast iron is slower to heat, but holds heat better than many other surfaces. I find that it’s so much easier to divide and serve mashed potatoes straight from the pan and that they keep warm that way as well. I used this pie server to cut and serve this mashed potato pie. The good thing about this tool is that it is serrated on both sides, which makes it very easy to cut any pie, not just this mashed potato pie. 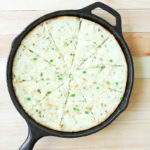 All you need to makes this mashed potato pie is a cast iron pan, potatoes, cream cheese with garlic and herbs, buttermilk, butter and some chives! And sprinkle some of those chives on top as well! The consistency of this mashed potato pie is very nice and creamy and they present beautifully. You can make this mashed potato pie ahead and store it right in the cast iron pan in a fridge with all the flavors in tact! And by the way, adding cream cheese makes mashed potatoes reheatable! This mashed potto pie heats up very well and always tastes great. Buttery Mashed Potato Pie is a wonderful combination of potatoes, cream cheese, and buttermilk. It's a delicious side dish to any meal. And these buttery mashed potatoes are conveniently baked in the shape of a sliceable pie – a new spin on an old favorite. Place potatoes into a large pot and cover with salted water, bring to a boil. Reduce heat to medium-low and simmer until tender, about 20 minutes. Drain. Preheat oven to 400 degrees F. Mash peeled potatoes in a large bowl with a potato masher until smooth. Lightly fold cream cheese and 3 tablespoons of butter. Stir in 3/4 cup of buttermilk stirring just until fluffy, but do not overmix. Add chopped chives. Spoon the mashed potato mixture into a lightly greased 3-quart baking dish (we used our trusty cast iron pan). Dot top of potatoes with remaining 1 tablespoon butter and cover with aluminum foil. Bake, covered, at 400 degrees F for 30 minutes. Uncover and bake 15-20 more minutes or until thoroughly heated. Sprinkle with additional chives before serving. I would like to make this for a party this week but want to have it ready to put in oven when guests arrive. How early can I prep so I can just pop in oven. Can I refrigerate or maybe cook potatoes 2 hours prior and add cheese etc place in pan. Yes this can be made a day ahead of time then popped in the oven day of. I would let the dish get to room temperature before placing in the oven however. Is it possible to use Sweet potatoes? ? If I were to use sweet potatoes, I would replace garlic cream cheese with either sweet kind of cream cheese, or use regular cream cheese and also add chopped fresh thyme. These look fantastic! What kind of cheese did you use? Boursin garlic and herb cream cheese.